I couldn't help but smile when I saw this on a blog yesterday... Me & Ty watched The Help with my family last week for the first time... and ty kinda started this little saying as a running joke to say..... it makes me smile! 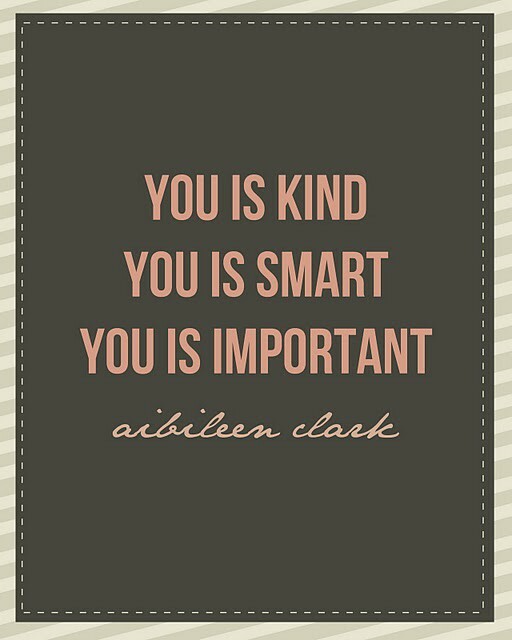 If you have not seen The Help yet I suggest you do so! It broke my heart to "re-live" the things they went through! I'm from the South & I'm from Memphis.. so I grew up hearing all about Martin Luther King and his movement (Memphis is unfortunately where he was shot).. It played a big part in school and we had several field trips to the Civil Rights Museum. All I have to say is I loved every bit of this movie, seeing the good & the bad. It had sad parts where I couldn't stop bawling, it had funny parts, and then there were a couple of times when I wanted to slap Hilly around.. but it was played out so well and had such a good flow throughout the entire movie!! I kept thinking about those moms who just took advantage of being mothers, who didn't really play their role.. It made me grateful for my little girl and the privilege I have to be a stay at home mom.. to raise her, to guide her, and to always be there for her. I could not be more blessed to spend every moment of every day with her! She is kind, She is smart, and She is IMPORTANT! She will always be my first priority! Such a good movie and book. I totally cried a few times too. You should read the book. There is a lot they didn't put in the movie. less you know me.. I'm not too big into book reading!